The AU51D Broadcast Audio Delay from Hotronic is a 20-bit device used to delay broadcast audio for synchronization to processed video. When activated, it can be used to delay programming up to 9.9 seconds for NTSC and PAL applications. This model works with digital and analog audio simultaneously and is a digital to analog converter or vice versa. In addition, it accepts sampling frequencies of 33.1, 44.1, or 48 kHz, which gives the AU51D the flexibility to deal with the increasing variety of today's digital audio formats. 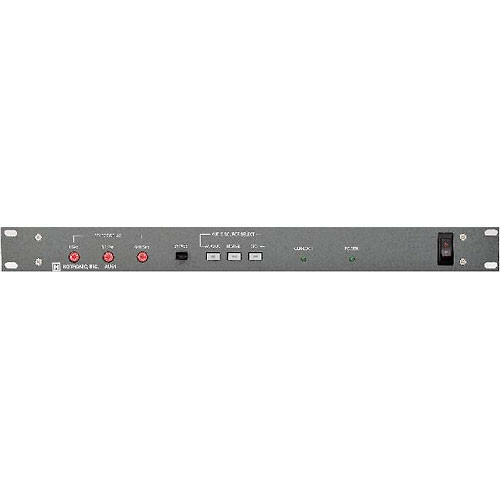 This unit can provide broadcast audio delay to work with NTSC or PAL television system. This device can delay audio to match up to 9.9 seconds of video. Independent bypass relays provide a fail-safe, hard-wired bypass in case of power loss. This unit will delay analog or digital audio and convert digital to analog audio. Box Dimensions (LxWxH) 22.4 x 17.8 x 5.4"